Many city folk dream of raising a few chickens in the backyard for the farm fresh eggs. Well, it can be done and it isn't too complicated. A small flock of chickens can become a great living compost pile. And with new understandings of the superiority of grass-fed organic animal products, including higher Omega-3 fatty acids coming from the eggs of such animals, free range chickens are showing up again on organic small farms, backyard mini-farms, and even urban lots. 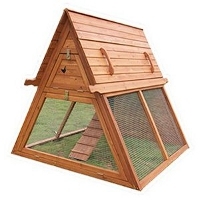 Chicken tractors are lightweight bottomless portable pens that fit over garden beds. They can be moved through pathways that need clearing and areas where the growing is complete for the season. Wherever the chickens are moved, they eat pests, pest larvae and pest eggs, and weed seeds. They aerate and churn topsoil, rip old garden residue to shreds, and fertilize with their manure, all while dining on an optimal free meal. The chicken tractor can become a sort of moving compost pile, also. If the chickens’ diet it supplemented with two popular organic gardening substances: seaweed (such as kelp) and diatomaceous earth, their manure will also add vital trace elements to the soil and their health will improve even further. The chicken tractor idea was made popular by the book, Chicken Tractor: The Gardener’s Guide to Happy Hens and Healthy Soil by Andy Lee, Good Earth Publications. This book gives details on care, feeding and the building of a variety of simple chicken tractors. How many chickens for a backyard? Chickens have flocking instincts, and enjoy being with members of their own kind. Three can live happily in a smaller area. For fertile eggs it’s suggested one rooster to every eight to twelve hens. If you can only keep three or four, it's best to just have laying hens. Do not keep one male with just one or two females together in a closed in area, he’ll ‘wear them out’ (I won’t go into any more detail). Also, while some roosters are quite docile, they can suddenly tap into their inherent fighting instincts, plus, they have sharp spurs for fighting on their legs. This is not a good idea around homes and neighborhoods with children (or even adults, for that matter). If a chick grows into a rooster that becomes a beloved pet, check with a vet about caponizing him and removing the spurs. Your vet may not be familiar with this procedure. In the olden days, and somewhat still, it was done to roosters to cause them to be less active, more docile, and become larger for future butchering. It was usually done with sharp tools right on the farm. If a vet is willing and skilled, it could be done humanely, although it was usually done to the males at a young age.